To provide safe on demand flights with personalized service. Our flights are based on your schedule. Don't worry about long security lines, aircraft delays and lost luggage; we make it easy! Call us for personalized service. We take care of the details and you enjoy the trip! 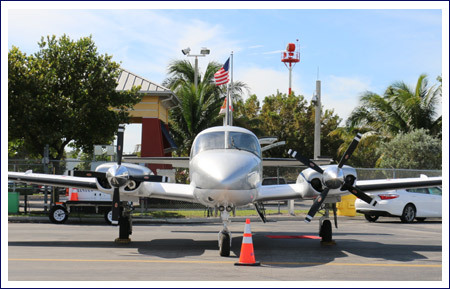 Aero Connection Air Charters is a U.S. Federal Aviation Administration (FAA) Certified Part 135 Charter Air Carrier located at Fort Lauderdale Executive Airport (KFXE). We have been in the air charter business since 2006 offering private charters within Florida, the Southeastern US and the Bahamas. Aero Connection Air Charters owns and operates a twin engine Piper Chieftain with a panther conversion for a smoother ride. The aircraft has passenger seating for 8. Aero Connection Air Charters is a safe and reliable airline with an excellent safety record. As an on-demand air charter operator we are ready to fly on a moments notice and pride ourselves on our punctuality. If it's a business meeting, family visit or vacation; contact our concierge flight service to book your flight. We also fly time critical parts; medical, boating, airplane equipment and crew. Charter us for your next connection to a safe flight! Aero Connection Charters is a safe and reliable airline with an excellent safety record. As an on-demand air charter operator, we are ready to fly you to your vacation destination, on a moments notice!